People have been driving motor-driven automobiles for well over a century. That’s long enough to allow us to forget that it took decades of trial and error for the industry to get where it is today, and it continues to evolve. For example, although the wheel was invented right around 3,500 years ago, the tire itself was only introduced in the mid-1800s. In fact, the word, “tire,” is said to have come from the strip of leather or rubber that “attired” the wheel. True story. Rubber was first used by Central American native tribes for making balls for games, or to cover containers to make them waterproof. Europeans liked what it could do and it became highly coveted. The Brazilian government outlawed the export of rubber plants, although smugglers got it to India and Southeast Asia (Vietnam, et.al.) It was great stuff, but it tended to melt in the Summer and become brittle in the winter. So, a man named Charles Goodyear dedicated his life to stopping this process and created a vulcanization process in 1839 that made it more reliable. Before long, rubber was everywhere. 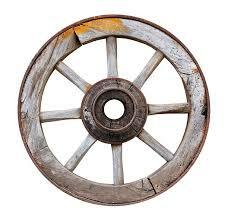 When rubber was first used to cover wooden wagon wheels, or attired it, it served as a cushion to reduce the jolt of driving on unpaved, often quite rough roads. To be continued….